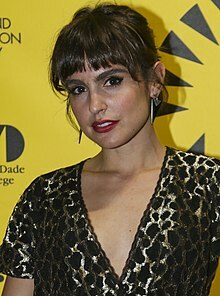 Verónica Fernández Echegaray (born 16 June 1983), known professionally as Verónica Echegui, is a Spanish actress. Echegui has been nominated for three Goya Awards. She is known for her roles in My Name Is Juani, My Prison Yard and Kathmandu Lullaby. In 2018, she made her American debut appearing in the FX series Trust playing one of J. Paul Getty's girlfriends, Luciana, alongside Donald Sutherland. ↑ "Verónica Echegui". Shooting Stars Awards. Retrieved 2 May 2012. This page was last changed on 29 March 2018, at 07:06.